shine down to let us know they are happy"
I am the youngest of 4 with 6 years between my middle sister and I, so growing up I was sort of alone except I had my neighbors. My next door neighbor and I are 12 days apart and our mothers were friends which meant we grew up together. I looked at R and Beth (her baby sister), and our neighbor M as my sisters. We were inseparable spending summer days creating dances, swimming in the pool and having sleepovers in the back yard. 7 years ago to this day Beth was suddenly taken from all of us which left a hole in each of our hearts that will never be filled. I still see her infectious smile and hear her laughter. Not a day goes by that I don’t miss her. I often find myself picking out things I knew she would love when shopping. That’s what today’s post is- a shopping tribute to Beth. Not only did she love stars but she was the star in our lives. She will always be a part of us and we will never forget her. Love and miss you forever and always Beth! Tiffany, this was a very nice post. I am sure Beth is smiling and very happy. I love what you said about her not only loving stars but was a star in your life. I like many of the items here. 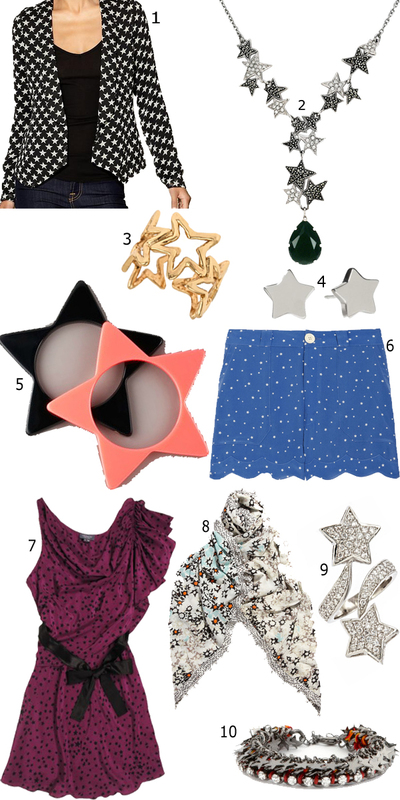 I really like the shorts and the ring (3 and 4). Thank you so much for sharing. This is a nice post. Beth surely is somewhere there smiling after reading this! I like the dress and the blazer a lot. Also the scarf.